In 1960 American Motors Corp styling VP Edmund E Anderson directed reboot of the oddly named Rambler American (the Rambler name originating from AMC's acquisition of Nash which made a Rambler model, but AMC made Rambler a brand and added an American model name...) -- regardless, the Rambler was changed from the roly-poly bathtub style to the squared off breadbox style -- a moniker that is particularly apt when you look at the wagon version. 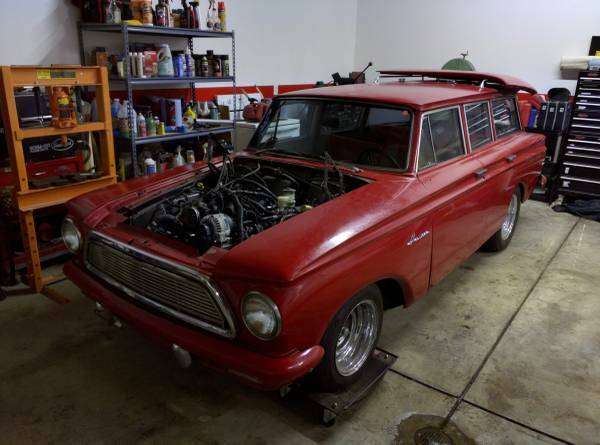 Find this 1962 Rambler American Wagon with LSX V8 offered for $5,000 in South Hillsboro, OR via craigslist. I left off when I was getting to wiring the motor up. fuel system is plumbed & running, fresh brake lines were plumbed - I think I they were bled. 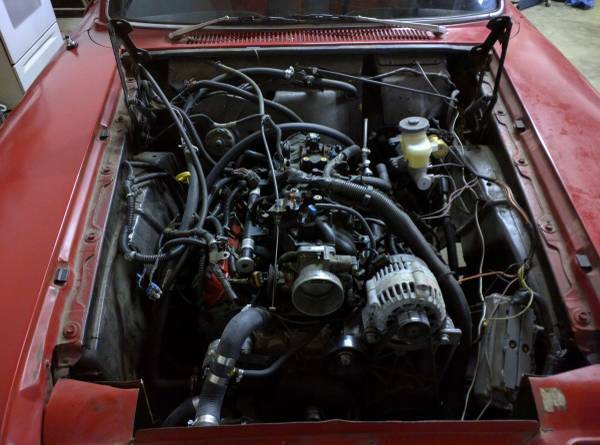 engine & trans are in and mounted with nice soft factory mounts. Rear end is in with new shocks. driveshaft is in. Trans needs the trans cooler mounted & the lines finished off for it + filled. Engine needs wiring - the battery was relocated to the trunk - the large gauge wire needs to be sized & bolted to the starter. The steering column needs to be wired in. The engine wiring harness has already been cut down to the standard no-emissions stand-alone style harness used in older hotrods. ECU is there - needs to be mounted, I don't remember if we flashed VATs off of it or setup the normal non-emissions tune on it yet. Need to plumb an intake and exhaust. the gas pedal that came with the car was a hinge and a piece of metal... it'll need a new one and a throttle cable. It will also need an alignment. weird, cheap, cool, I hope someone buys this and gets to enjoy it! Is there a state law in Oregon that a certain number of cool cars and garages must be maintained to get some kind of tax credit or something? Having lived in Portland for a year or so until recently, a lifelong easterner like me was forever amazed by how long so many cars and trucks (and motorcycles) last when not eaten by tin worm. The shear volume of old Volvos used as daily drivers is amazing. Truly the holy land of cool cars and trucks. Notice the percentage of online car sites listing PNW vehicles. 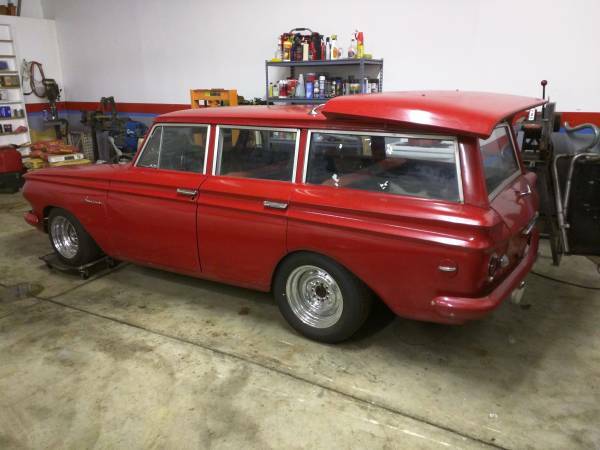 This old Rumbler is very cool and along with such about every station wagon ever made, I would love to own it, even with the flathead 6 and 3 on the tree. Put a great roof rack and it enters some hallowed space in my car fantasies.